Here’s what happened in last night’s session of Hoard of the Dragon Queen as the adventurers travelled through the Mere of Dead Men to Castle Naerytar. Each PC gets 1,370 xp. The PCs continue through the swamp without Gwastdyn who returns to the Carnath Roadhouse to fetch Jamna. Ug blunders into some quicksand and has to be rescued by the others. A splash in the distance is followed by ominous silence but nothing further happens. At dusk, the party reach a campsite on the trail. Here, they ambush a group of nine lizardfolk who arrive in canoes to collect the stolen loot for onward transportation to Castle Naerytar. The last surviving lizardman, Snapjaw, surrenders. He proclaims the PCs as “great warriors” and tells them a lot of useful information about the castle. The “dragon kneelers” are led by an elf called Borngray; Rezmir and a man in red robes are there now too. Also at the castle are the hated bullywugs led by their shaman Spattergoo, and lizardfolk of Snapjaw's Scaly Death tribe. Spattergoo killed their shaman, Suncaller. After some discussion, the PCs promise to help Snapjaw and the lizardfolk overthrow their enemies. Travelling into the swamp in canoes, the PCs are attacked by the Weed That Walks. 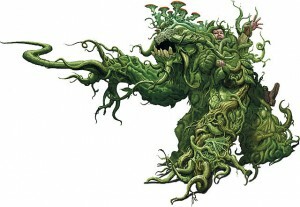 Crake is engulfed in the shambling mound’s body but manages to escape, and the adventurers slay the beast. They don’t hang around for long as Snapjaw warns them that the Weed will soon walk again. Later that afternoon, they arrive at a lizardfolk picket half a mile from the castle. Snapjaw convinces the guards that the PCs are great heroes come to destroy the bullywugs and the party are allowed to pass. The guards tell them there are 100 bullywugs living in and around the castle. The PCs arrive at Castle Naerytar at dusk. Leaving Snapjaw in his longhouse outside the castle walls, the adventurers scout the perimeter, identifying the north west tower as the ideal point of ingress. Rosie casts fly on Ug who flies up to the third floor of the tower and in through an opening where he secures a rope for the others. Turin and Rosie climb up followed by Crake, as Ug flies around the tower and spots three guard drakes in the inner ward below, and several lizardfolk and bullywugs in the larger outer ward beyond. As Turin and Rosie look around the room, five spectres rise up from the shrivelled corpses lying on the floor. Turin is struck twice but Rosie’s dark patron Sekharet protects her from the spirits and they are too wary to approach. Crake arrives through the window and draws one spectre away from Turin. Meanwhile, Ug tries to open the trapdoor so he can join the others from the rooftop, but a spectre phases through the ceiling to attack him. The half-orc destroys his opponent and gets the door open. Together, the PCs finish off the other spectres. After searching the room, they decide to have a long rest to recover from the undead’s life drain. Forcing open the sealed trapdoor in the floor, the PCs are greeted by the foul stench of the cesspit at the bottom of the tower. Not much remains of the second floor but Crake scampers across a slippery beam to loot an abandoned treasure chest. Then, the party head downstairs to the ground floor. When Ug tries to leap across the garbage to the exit, he is grabbed by the tentacles of a lurking otyugh and pulled beneath the rubbish. Turin dives in to help him but makes a hasty retreat to the surface when he is bitten by the foul creature. Ug manages to free himself from the tentacles twice but each time he is grabbed again as he tries to escape. Rosie and Crake remain on the stairs with attacks readied, but the otyugh does not emerge. When the paladin is flung across the room and into a wall, taking him down to 5 hp, Turin decides to make a run for it and opens the door to the inner ward. Unfortunately, this draws the attention of the three guard drakes, who advance on the bard, surrounding him. Deciding that being trapped between the otyugh and the drakes is a bad place to be, the PCs run or misty step past the lizards and into the courtyard. 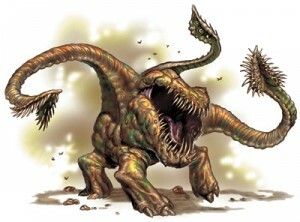 Luckily, the otyugh grabs one of the drakes and pulls it down into the garbage, allowing the party to kill the other two.